It's often been said that what holds Maine together is nothing more than rolls of duct tape. 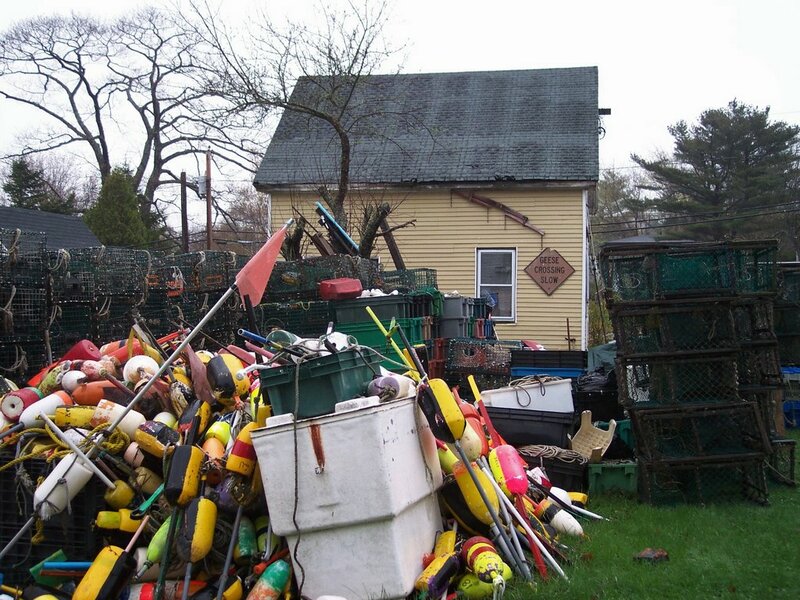 Well, on Peaks Island, our cars and trucks are the stuff of legends. Many seem to have been reclaimed from Havana when the Cubans gave up on them. 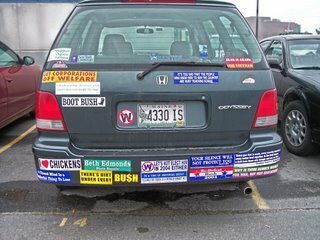 In simple terms, I believe what holds many of our vehicles together are bumper stickers. Now, here's an art form few have taken the time to analyze. 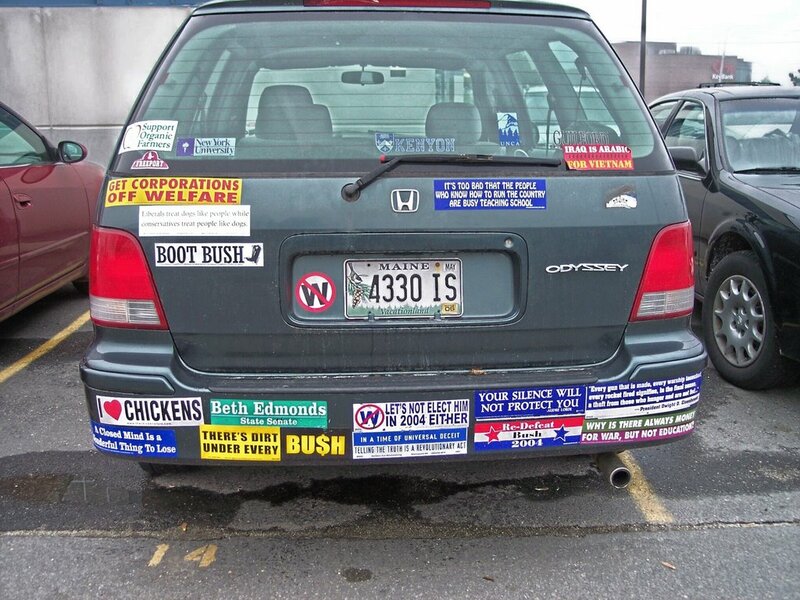 I can often be seen behind a vehicle just standing there reading all the bumper stickers imaging the possible owner of the vehicle in my mind. Most bumper stickers tend toward the political but some are just plain funny. Save Tibet, oust Bush and save animals seem to be constant themes. Yet, I did see one rugged individualist put one on his vehicle that stated: I'd rather be hunting with Cheney than riding with Kennedy. Ouch! Frankly, right now I'm waiting for: If at first you don't secede, you're beginning to fail ---Dan Quayle. Thanks DQ, you're still the gift that just keeps on giving! 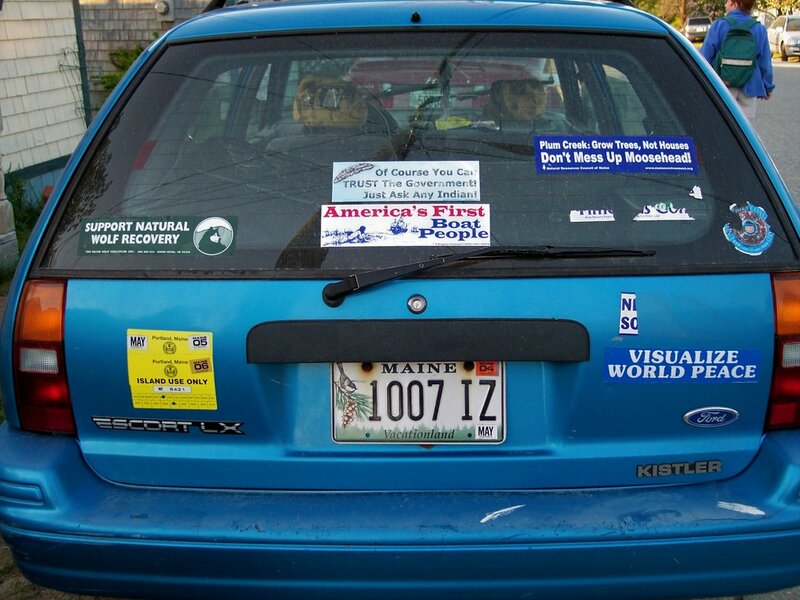 I've always wondered what happens when a staunch conservative Island Republican buys a vehicle from a staunch Island liberal Democrat filled with political bumper stickers. Sounds like a stressful situation in the making to me. Oh well, it's a pretty quiet day after the Memorial Day start of the Summer weekend so my mind does wander. A t-shirt can always be a walking bumper sticker as well. Enjoy the quiet; it won't last for long. Summer has definitely arrived on Peaks Island. The boats have been running all weekend long filled with people taking in the views from the top deck of the boat. Islanders though usually ride the lowest deck possible. We really aren't obstinate, we just tend to like the quiet moments a nice ride into Portland provide and a nice chat with one of our neighbors. 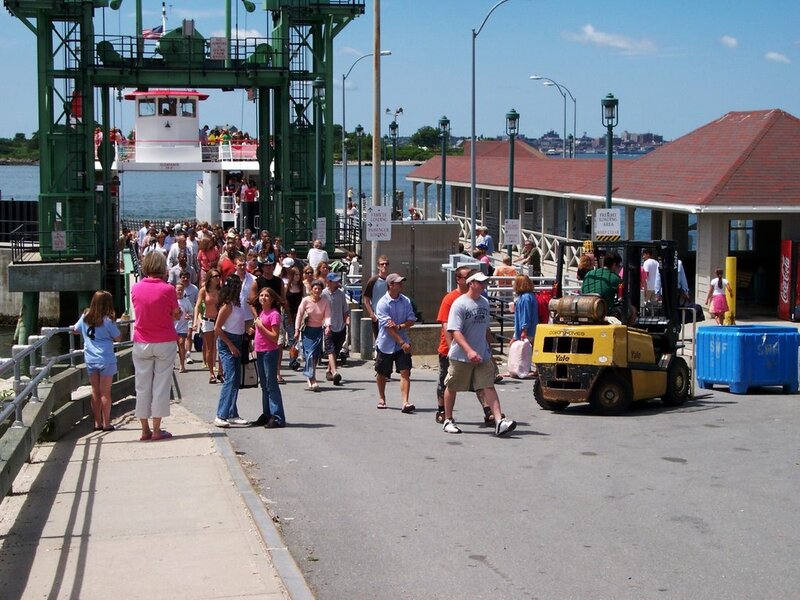 Usually a Maine Memorial Day Weekend begins about Thursday with many many vehicles passing through the Kittery toll booths filled to the roof with their stuff and expectations for another Summer of memories and things to accomplish. 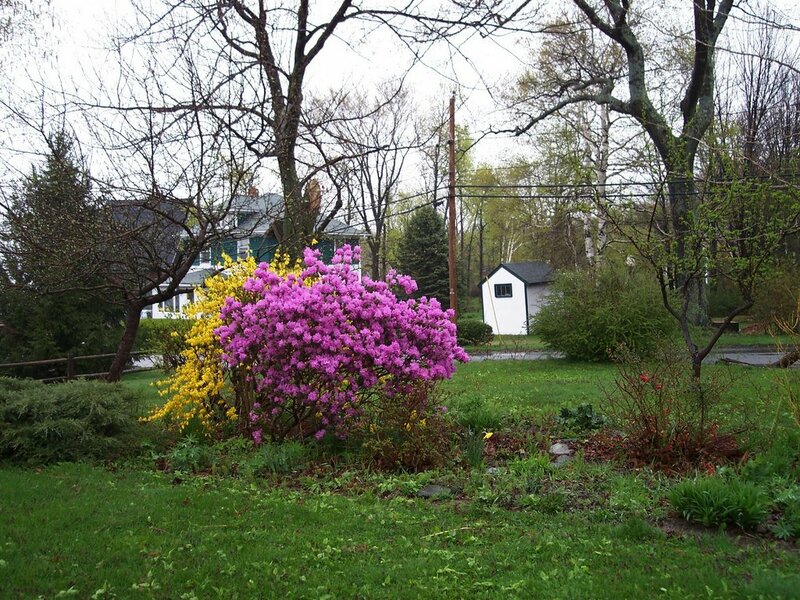 Of course, by Friday evening after everyone's packed into their Maine destination, the clouds have rolled in, the temperatures have dropped and the mists have blossomed into drizzle and finally harvested into rain. Some of my fondest memories are of weekends like this camping at Patten Pond down in Ellsworth. Sitting as close to the fire as possible, drinking way too much wine, freezing, eating way too much and, of course, laughing all weekend. Yet, this weekend has welcomed Summer with open arms. The temperatures pulled a reverse this year on Thursday and climbed into the upper 70's, the sun has remained constantly present and the sounds of lawn mowers all weekend have never ceased. If you see someone down front with wrinkled shorts and white stubby legs that's an Islander who just crawled through his closet pulling out a pair of shorts buried since last October. No matter, it's a time of new seasons and new hopes for some rest of a weary soul. Enjoy this Memorial Day Weekend and may it be spent with ones you care about. The pics are all from this weekend and just represent stuff that caught my eye; enjoy. As another Memorial Day Weekend and Summer rapidly approach us, my memories return to many Summers past and my times in the White Mountains. 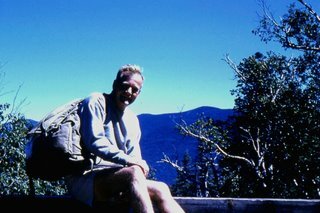 Most every Summer between 1952 and the early 1970's, I spent time hiking the trails of the White Mountains, usually Mt. Washington. 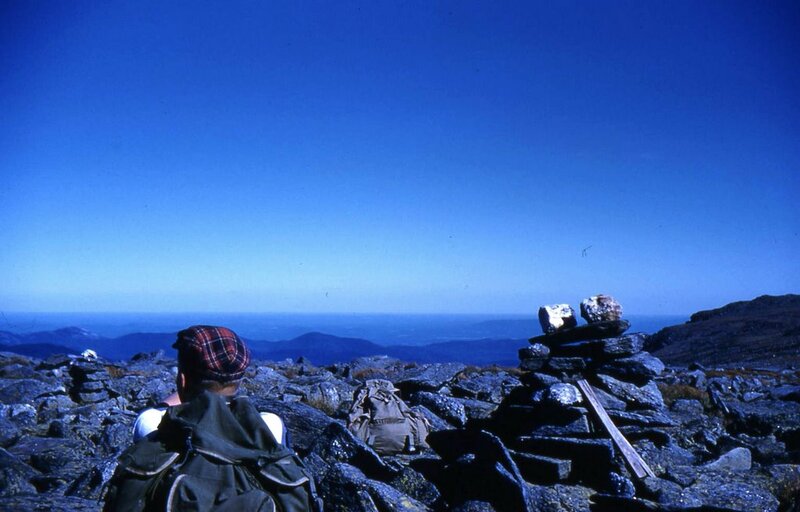 Many an hour was spent trucking up either Tuckerman's or Huntington's Ravine, across the Ballfield to the Summit. 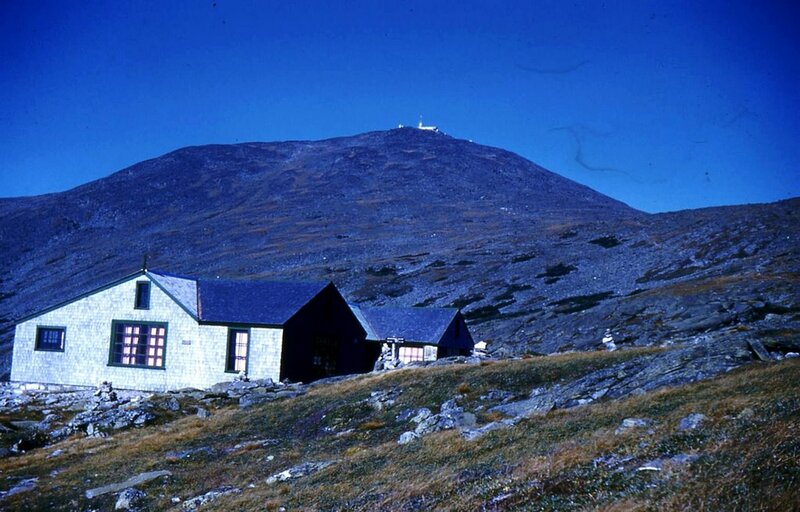 After watching the Tourists watch us, we'd finish the day at the Lake of the Clouds hut helping the crew of college students prepare the evening meal and falling into bed shortly after nightfall. This started for me as early as I can remember, standing on the curb at 5am holding a flashlight while pictures were taken of my Dad and brother and friends piling into a 1949 Ford coupe for a big adventure mountain climbing. I didn't realize exactly what they were doing but I certainly knew I wanted to do whatever they were doing and just as soon as possible. Somehow through whining, sniveling and whatever else I could bring to the table they took me along in the Summer of 1952 at the ripe old age of 10. I got pushed, pulled, towed and dragged up Huntington's Ravine to the top of Mt. Washington and got to sleep at 5,000 feet plus at the Lake of the Clouds. Walking onto the summit that first time was a huge feeling of accomplishment. I was definitely hooked. 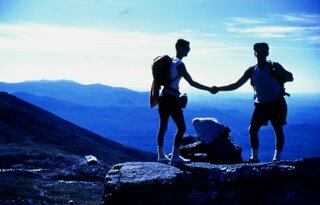 My last time up Tuckerman's was a little more than 20 years ago yet the memories are as clear as yesterday. Many friends came with us over the years who still talk about the aching muscles, muddy feet and many memories of laughing and singing our way up and down the numerous trails we covered over the years. Nearly as much as the ocean surrounding me, my love of the mountains has always remained strong and present. While I'm waiting for every boat I always take a peek westward to see if the snow's off Washington yet; fond memories indeed. Well, finally, some strong, true sunlight is flowing upon the land of Peaks Island. We did have some sun last Wednesday and Thursday. It kept popping in and out from behind the clouds but it was dry enough to get a start on trying to catch up with the ever lengthening grass but start we all did. 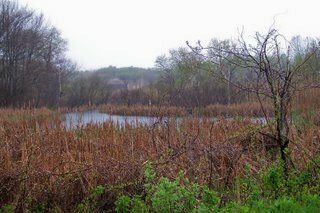 Of course Friday brought us fog, rain, drizzle, mist mixed in with a few dry moments. The view as the picture shows left a little to be desired. Yet---- kaboom!!. Yesterday, while heading into Portland I walked down Welch Street toward the boat and voila, an interesting vehicle was at the head of the line waiting to get on the ferry. Walking past it, I promptly declared the silly season as definitely here. Apparently, the first wedding of the season was taking place. 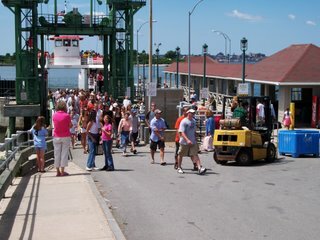 Definitely a silly season approach to moving people from the boat landing dock up Welch Street to the Inn on Peaks. It must be at least two hundred yards!! Whatever! Yet, today is a beautiful day on the Island. Allegedly, the clouds will be moving in this afternoon with a chance of some showers tonight. The roar of lawnmowers can definitely be heard this morning as most everyone is attempting to catch up. Guess it's my turn now to head on out to see what I can accomplish before tackling the Sunday paper. Yup, it's still raining. Frankly, I've lost count as to how many straight days of rain we've had. It'll easily wind up being over a week since this mess began. Yet, no sniveling is allowed!! 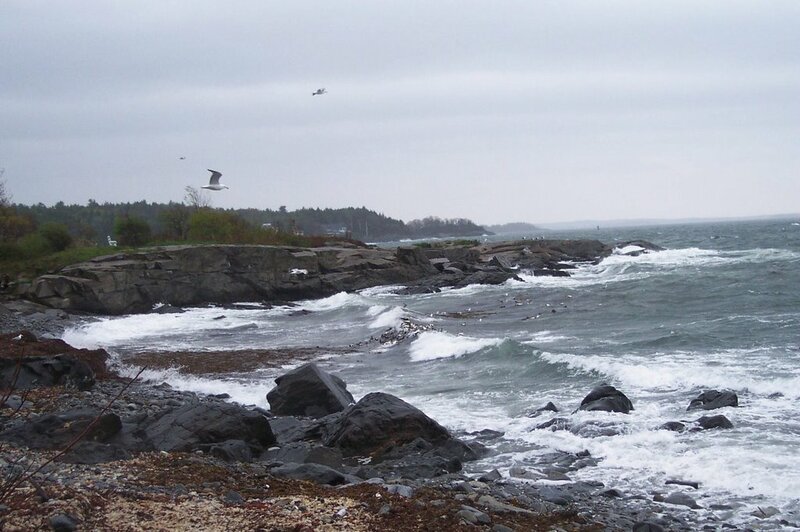 Peaks Island stands right on the border between the systems. Sunday afternoon I looked north and saw some blue, bright sky near the horizon. Turned to the south and all I could see were storm clouds and rain. At least Peaks contains no major rivers, at least till this week and no dams. All we've got to complain about is our drenched psyche's and very damp basements. If there are any weak spots in a roof, this past week has definitely exploited it. Buckets have been definitely in order. Still, people get on the boat to go to work, buy groceries, run errands and continue their lives. We're so much better off than the people south of us between Old Orchard Beach and just north of Boston and anywhere in southern New Hampshire. We will not be flooded out, our homes will not be ruined and we can walk to our homes and feel safe. For that we are thankful. Yet, we are New Englanders and complain we will as we spit in the eye of the weather. 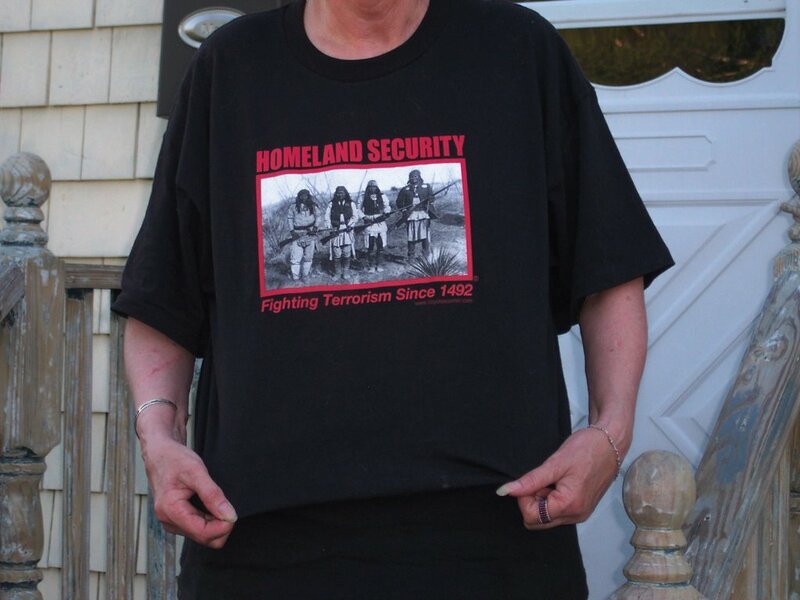 We Mainers were not called the Land of Rude People for nothing by the first explorers up from the Bay Colony. Some things definitely don't change. Allegedly, two more days of this and then maybe we can begin the drying out process. 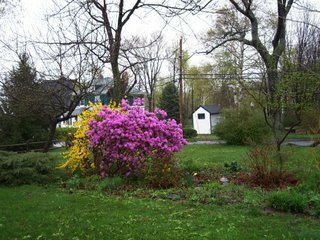 Each and every year between the months of May and June, one of them is a washout and one is beautiful. I think we're ready for the "beautiful" one now. As one Islander said to me, it's time to forgo the Red Sox and go forth and gather up two of everything you can find. Sounds like words of wisdom to me. Stay dry!! 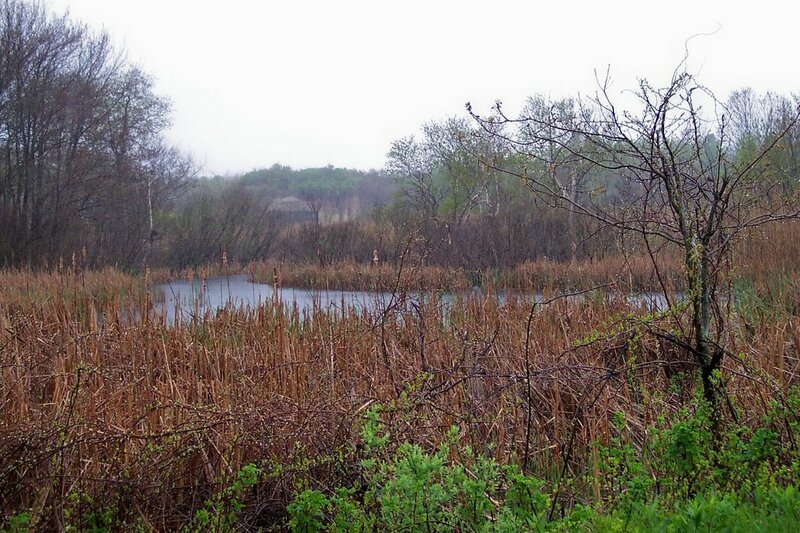 Just another dreary, damp day in paradise. I've just returned from my morning trip to the post office and Hannigan's. At least I can now see what bills need paying while having some lunch. 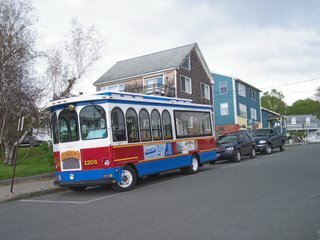 Many new cars on the Island this weekend so the silly season is starting to move over us. Lots and lots of people moving around under umbrellas and oilskins trying to stay dry; forget about it; just walk and become one with the dampness. I made it to the back side of the Island and the ocean definitely didn't look springlike. 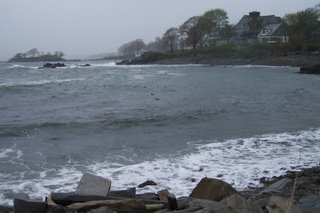 It was pretty active and churning up quite a bit of loose kelp; good for everyone's garden and free for the picking. The winds were pretty stiff so the seagulls were just floating around gliding away without a lot of effort. The ducks were just hovering together riding the surf as close as possible to the shore and attempting to stay in the lee of the rocks. A perfect day to crawl under a quilt with a good book. Or, you can sit by the window and just watch the grass grow. Since we're into our fourth day of rain with most likely three to go, it's time to bring in the goats and horses to try and stay even with it. We'll all be harvesting our yards come Thursday or Friday. Oh well, it's always something. Enjoy the day and Happy Mother's Day to all the Moms I know. I've always enjoyed hearing the stories of how individuals living on Peaks Island got here. The tales are so interesting and varied. We actually stumbled onto the Island while on a picnic on House Island. We wandered around to the back of the Island, stood on a small sandy spec of beach and looked over at Peaks Island and uttered our famous words "I wonder what it would be like to live on that Island?" That lead to a trip out to look at a house for sale on Island Avenue and many hours of wondering what it would take to make a home out of the Island. Fortunately, a fresh newspaper ad popped up the next day for a different house. 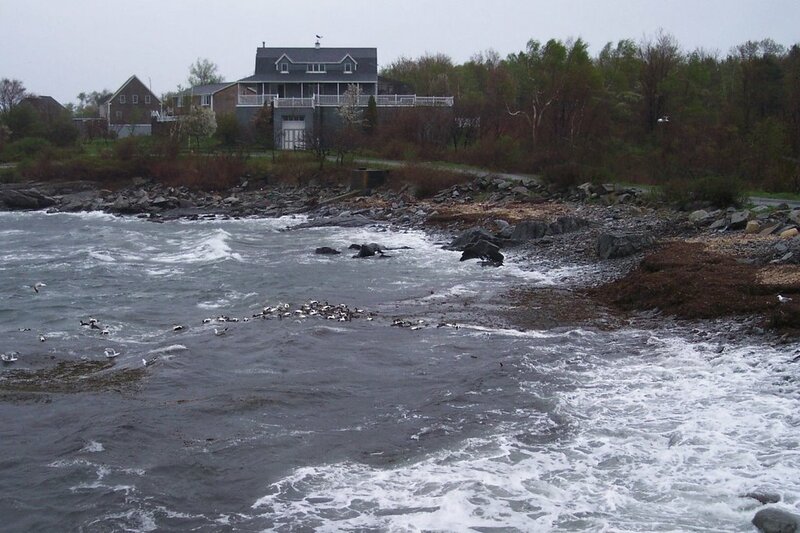 We saw the house at noon, signed an offer by 1pm and had it accepted by 4pm so voila, we owned a Peaks Island house. We returned the next weekend and sat down and wept with the classic what did we do buyers remorse feeling as we more closely looked at the house and everything that needed to be done to get us all through a winter. Well, thirty one years later, we're still here and still working on getting things fixed, some for multiple times. But, what really got me here is my love of living by an ocean. The sea absolutely fills my soul, settles my whacky muddled brain down and constantly puts me in my place. In my youth, my father built a small camp in the basement of our house in Hopedale, MA. 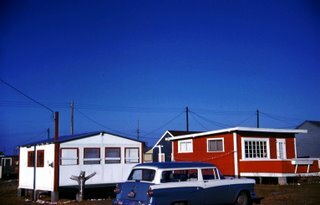 Somehow, he created a nice jigsaw puzzle of 2x4's, wall frames, roof beams and transported everything down to Roy Carpenter's Beach in Matunuck, Rhode Island and erected it on a site. This site was one of many sites on land owned by Roy Carpenter. For $75. 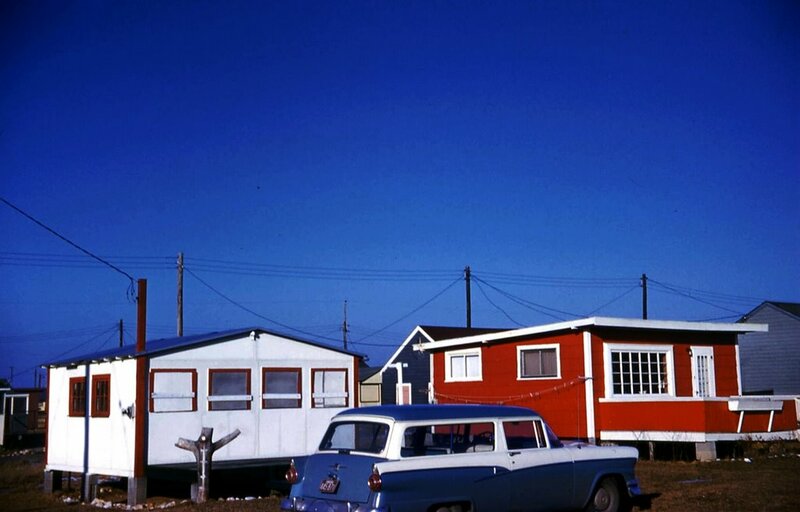 per season you rented the lot, paid the property taxes and got to use your own home built camp. I've never seen anything like this then or since. Frankly, this site is still there and still operating but I believe the annual cost is about $3,000 per season now. 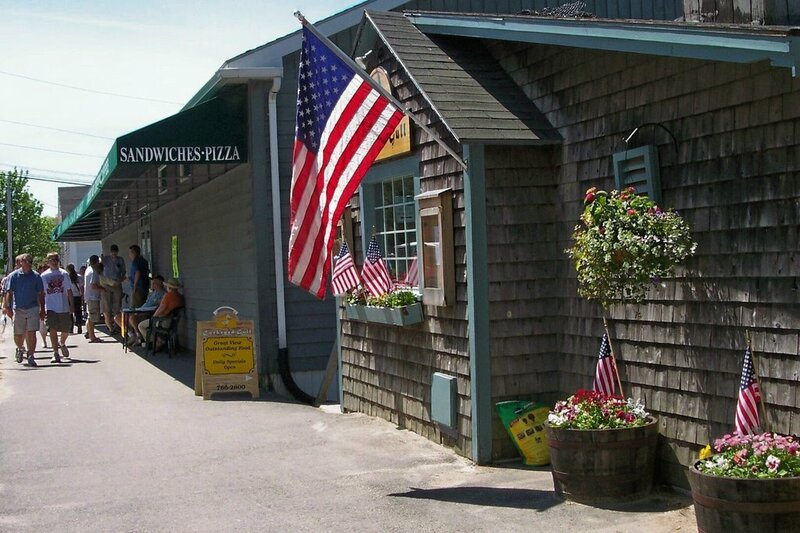 The community store and community bathrooms opened on Memorial Day Weekend and closed Labor Day Weekend. Most of the people came from the Providence area and entire families moved down for the summer with Dad commuting back and forth. Our little camp had two beds, a bunk bed, a tiny kitchen area, a folding table and a reading chair. On rainy days we had to stay in our bunks since there was no room for everyone to walk around at once. 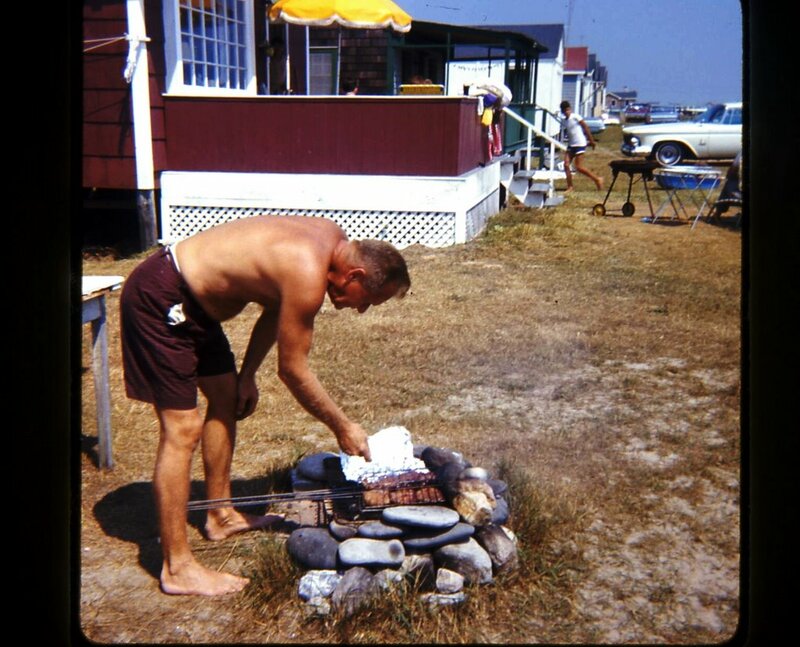 In return for the small space, we literally lived on the beach for twelve weeks every summer. This arrangement lasted until Hurricane Carol in 1955 moved our little camp about one half mile inland and deposited it in a pile of rubble along with all the other cottages. After a short family meeting in which I had no vote, the decision was made to rebuild and this time the new camp was twice the size of the old one with two chairs and a permanent table. During my high school daze, I did everything I could to get out of going down there but after college I did everything I could to spend as much time as possible there. It was a place that just settled me down and provided much needed respites. After we had finally found a bank to give us a mortgage (no one seemed to want to lend money on Peaks Island property back then), I spent my first night in the new house sleeping on the living room floor. Waking up in the morning to the gulls, a warm sun and the sounds and smells of the lapping water, I knew I had found my forever home. 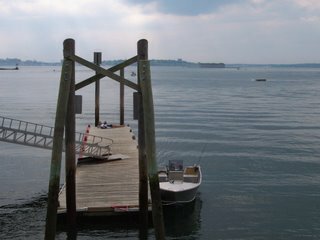 It really was a very short trip between Matunuck, RI and Peaks Island, Maine. In some areas of your life, it just might be possible to go back even if the locale has moved. 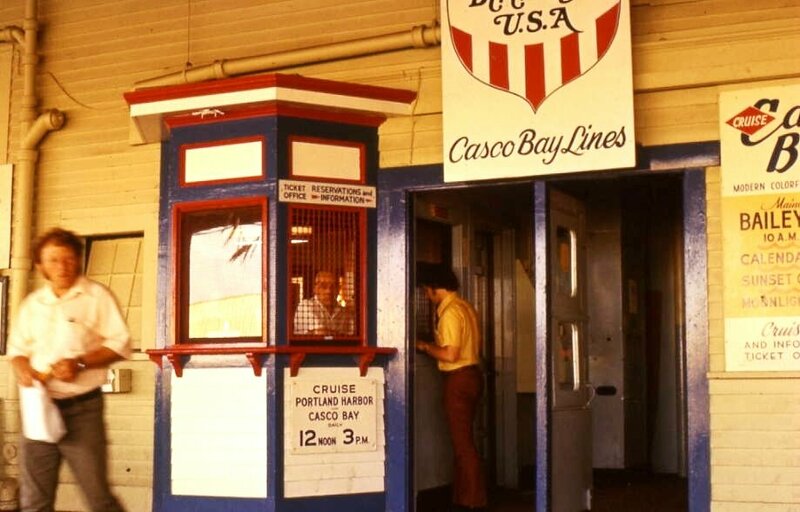 Arriving on Peaks Island in 1975, our only way home at night was to pass through the aging portals of Custom House Wharf to the Casco Bay Lines. Down an aging pier with warped decking, past Boone's Restaurant, past the Porthole Restaurant and into the waiting area for the next boat to Peaks. In the ten years I made this trip I don't ever remember the waiting area being painted. 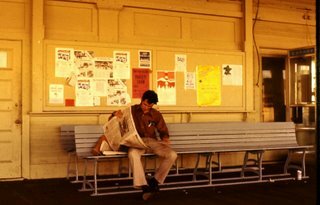 I do remember spending many waiting times reading the gray stained walls for the latest additions of hand written news updates and philosophies. The waiting room had seating for about ten and standing for about twenty all under a single flourescent unit that flickered in perfect syncronization with your heartbeat. I won't even discuss the facilities. 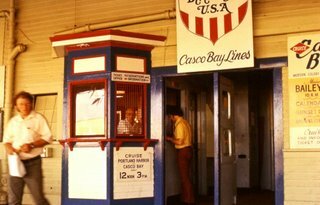 Unless it was below zero with a strong breeze blowing down the Fore River, the waiting for the next boat took place outside under an ever more warping roof. Of course, whenver it rained it was absolutely necessary to open your umbrella or pick a spot that the rain wasn't cascading down through the roof. 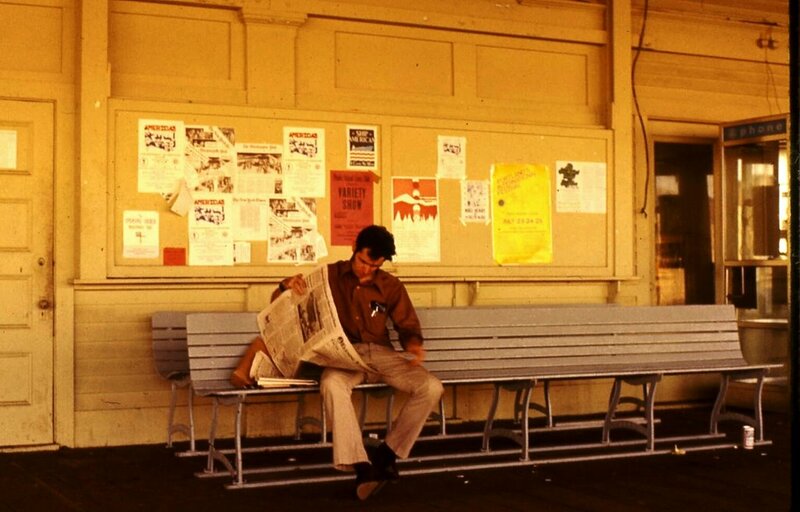 Yet, that outside waiting area was perfect for many a game of kick the can for the kids returning from a Maine Marriner's Hockey Game. We parked our car in the Hub Furniture parking lot and walked down the hill to the Bay Lines. There was nothing like the annual Memorial Day Weekend Friday night 5:30 boat to Peaks. If ever there was a Hong Kong Express, that was the boat. Coming down the hill you could see the milling mob jockeying for position to get on a boat. The wharf was filled with humanity back past the Porthole and often all the way down to Boone's. How we would ever squeeze the number of people that use the boats today into that old decrepit facility is impossible to imagine. 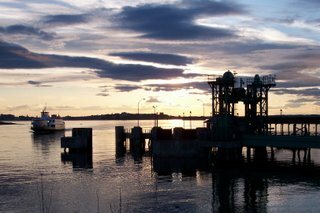 Yet, as always, a number of Islanders objected to leaving Custom House Wharf for the facilities we use today. The term "quaint" was used often and loudly but fortunately, saner, longer term thinking prevailed. Enjoy these views of the old Custom House Wharf. Yesterday's pure rainy day turned into today's "soft" day. It's just been a day of heavy mist with cool temperatures. Not dry enough to do very much outside but walk downfront to get the mail and just damp enough to give yourself permission to open a book in mid-day while under a warm quilt on the sofa. Not a bad day by anyone's definition. I remember a few years ago we had about six straight weeks of sun and clear blue cloudless skies in the summer. The Island just ramped up more and more with each passing day. The term "frantic" crosses my mind remembering that period of time. The Island definitely needs a "soft" day now and again to just settle down and take a day off. Today was definitely that day. 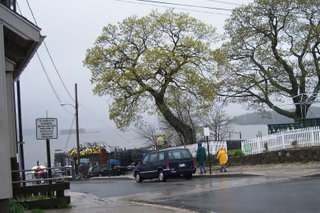 Not many people out and about but with no sun and a nice mist, the colors of spring really seemed brighter today. Spring starts for me on March 1st; early of course but of extreme importance for my psychological well being. This is followed by watching the NCAA basketball tournament then the Masters Golf Tournament and then it's time to move outside. Of course, one walk around the property developing this year's listing of things to be done by the first snow of November is enough to bring on a hasty retreat to the couch for the Red Sox Opening Day game. Of course, this avoidance cannot continue much longer so today's "soft" day is truly a gift. For sure, today's peacefulness will be removed this weekend as the sun returns and the sounds of lawn mower engines engulf the Island. Right now Islanders have quit watching paint dry and we're all watching our grass grow--by the minute today. The brownish hue has given way to near total green and is growing about an inch an hour it seems. Oh well, just one more thing to put on the "to do" list for this weekend. Some time, a sunny day is not all it's made out to be. 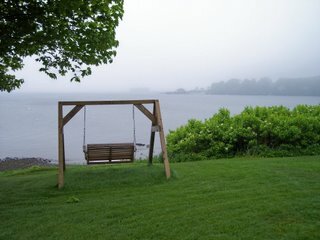 Enjoy a "soft" day when it comes along; we can all use the downtime, wherever we are. Now, there is always a fine line between news and a rumor but on the Island, it often really blurs. Yet, as I've always believed, Island news or rumors often have a common thread between them; they travel fast but they're often wrong. Well, today, I've got a beauty I heard about yesterday. Late last week, a couple of Portland officials were spotted at the bottom of Welch Street. 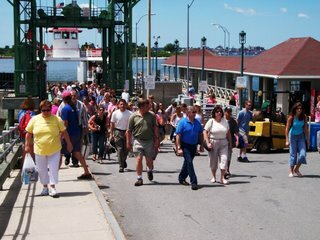 It's reported they were overheard discussing the ongoing problem of people leaving the boat and walking up the middle of Welch Street rather than walking up the hill on the sidewalks. The reported solution to this puzzle was for the police officers who meet every boat to issue citations for jaywalking to those walking up the hill in the middle of the street in accordance with current Portland statutes in order to change walking behavior. Huh!!! If anywhere near reality, this action could well be the start of something very interesting. The above pictures represent an average landing at Peaks during the Summer months. Now, a couple of instant brain flashes occur as I imagine Officer Randy getting out of his police vehicle fully armed with his sharpened pencil and ticket pad to confront the humanity leaving the docked boat. The first image is of Kevin Bacon fully attired in his ROTC uniform in the movie "Animal House". Confronting an oncoming mob with the simple words "remain calm, all is well", he is instantly made one with the pavement beneath him. Yup, good luck Officer Randy!! The second image I have is we would absolutely have to send a rider down to the Church in Stockbridge and find Arlo Guthrie. Can't you see the potential for an Alice's Restaurant redux if Islanders were placed in custody for jaywalking. Wow, this could lead to news feeds, t-shirts, songs, bumper stickers; an entire new cottage industry sweeping the Island. Oh well, I've always believed in the old adage "rules are made for times when brains run out". Sure seems to apply in this situation. I'm hopeful some reality will set in somewhere but regardless, it sure made for a big "smile" on a Monday morning. If anything newsworthy or rumor worthy breaks, I'll let you know.